Square number 7 in my Sprite Stitch stitch-a-long project is another blackberrybear creation, and likely requires no introduction. At least if it does, you definitely weren’t a child of the 80s. 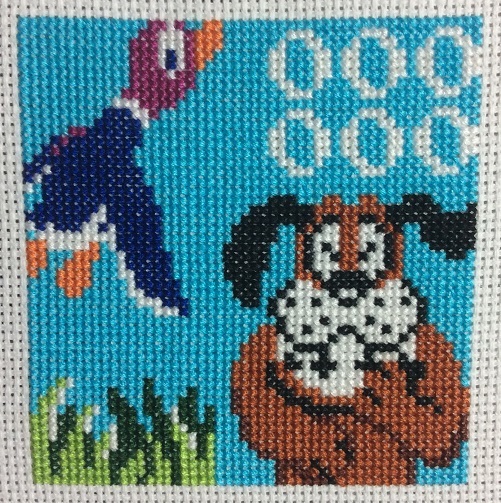 I sucked at Duck Hunt. I mean absolutely sucked. I saw a lot of the laughing dog. Stupid dog. The only way I could even attempt to play the game was to exploit the trick where you hold the gun with the tip only an inch or so from your TV screen to mess with the light sensor. But it makes for an adorable cross stitch square! 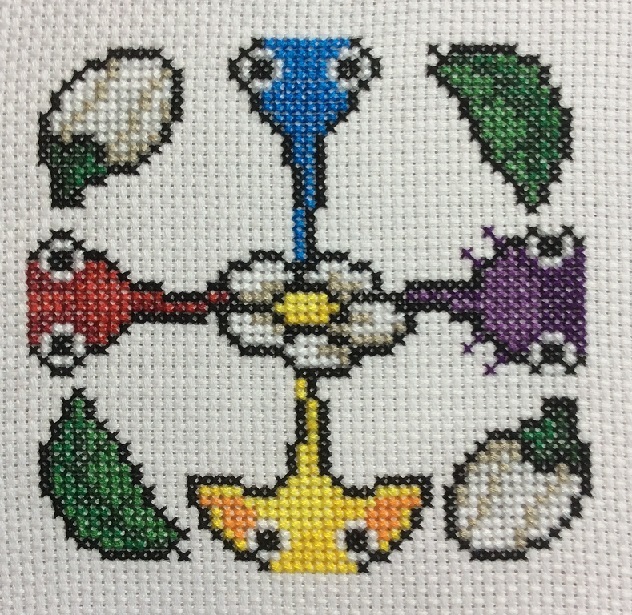 Next up in my Sprite Stitch stitch-a-long project is a square from Harvest Moon. This one was designed by blackberrybear. My first introduction to the Harvest Moon series was Harvest Moon DS for (obviously) the Nintendo DS. It’s probably a good thing that my DS didn’t track my playtime, as I’m guessing my total hours clocked into this game rivals what I put into Skyrim. I simply couldn’t put the silly thing down. Seriously, I even kept my DS by my bed so I could tend to my farm when I woke up in the middle of the night. Who knew a farming sim could have that kind of draw? Even my Mom (whose previous gaming experience was basically limited to Tetris) loved the heck out of Harvest Moon. I’ve played other Harvest Moon games since then (as well as a couple of the Rune Factory games) but none of them have had quite the same charm as Harvest Moon DS. While the artwork for this particular square is from the original Harvest Moon for the SNES (which I never played), it’s still Harvest Moon. So how could I not stitch it? 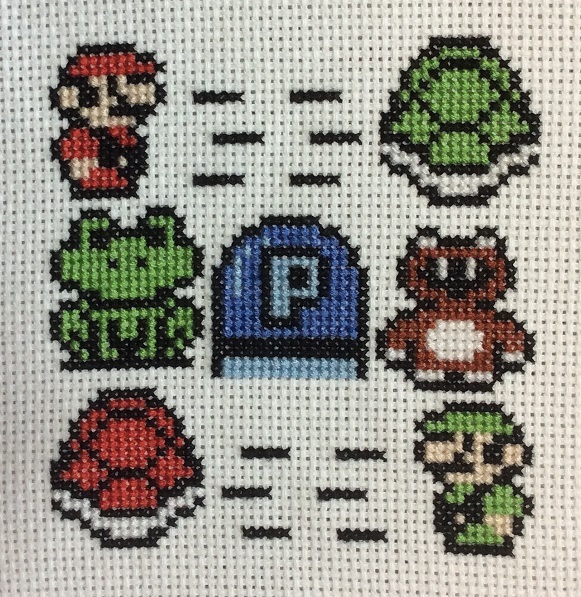 For the final week of the Sprite Stitch stitch-a-long we were able to choose our favourite from the submitted designs to stitch. The Elder Scrolls V: Skyrim is hands down one of my all time favourite video games. It is second only to World of Warcraft for the number of hours it has sucked from my life – and it was worth every one of them. So I knew my final square would have to be one of the two great Skyrim designs that were submitted to the stitch-a-long. The first was created by Pyper and provides room to experiment with some blackwork. 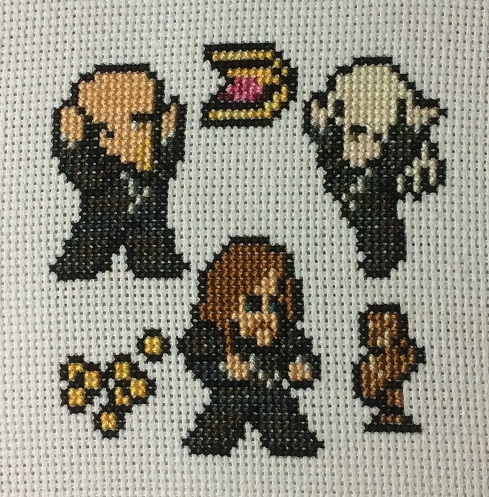 The second was created by BooChocoBoom and is hard to resist if you have a soft spot for the Thieves’ Guild. I loved the idea of trying my hand at some blackwork and originally started into that pattern. However, it became apparent that within the context of my entire project the blackwork just didn’t fit in and made this pattern stand out heavily from the rest. So I pulled out the stitches and opted to commemorate the Theives’ Guild instead. I’m not very happy with how the yellow for Devlin’s goatee blends in with the rest of his face. I literally tried eight different shades of yellow and didn’t like any of them. I may still pull it out and make it brown instead. It wouldn’t be true to the game, but at least it would be noticeable that way. Does anyone have any suggestions? Although the official stitch-a-long is over, I am still planning to stitch another twelve squares for display in a multi-frame, so be sure to watch for more updates. You can also check out the rest of the stitch-a-long group’s progress over on Sprite Stitch. So I’ve chickened out and switched from 14ct aida to 16ct for my Sprite Stitch Stitch-a-Long project. 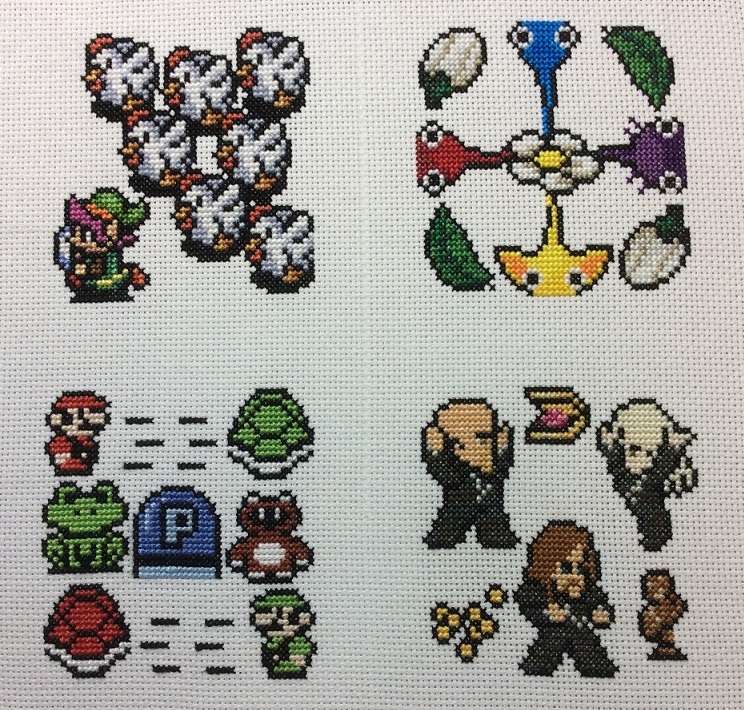 If you recall from my first post the stitch-a-long consists of four video game themed squares, but I’m planning to extend my sampler with a bunch more of the submitted patterns for display in a 16 picture multi-frame. 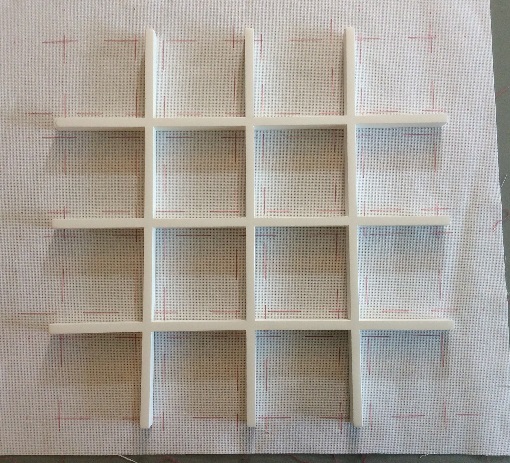 When I tried to align the couple of squares I had stitched on 14ct fabric into the frame, it became apparent that due to the bars on the frame not being perfectly straight I had zero wiggle room for some of the squares. Meaning if my blocking isn’t completely perfect I’ll be in danger of losing some rows of stitching under the cross bars. I don’t have a lot of faith in my blocking skills so a higher count fabric will give me a little more room for error. You can see that there’s a lot more space between where the stitched blocks will be (marked with the pink lines) and the bars on the frame. It’s a little more space than I would have liked but hopefully it will still look pretty good. I started stitching the new fabric with the week three square – a Super Mario Bros 3 motif designed by SofaraStarfyre. There’s only one more official week to go, but there are still plenty of people just getting started, so head over to Sprite Stitch to join in on the fun! 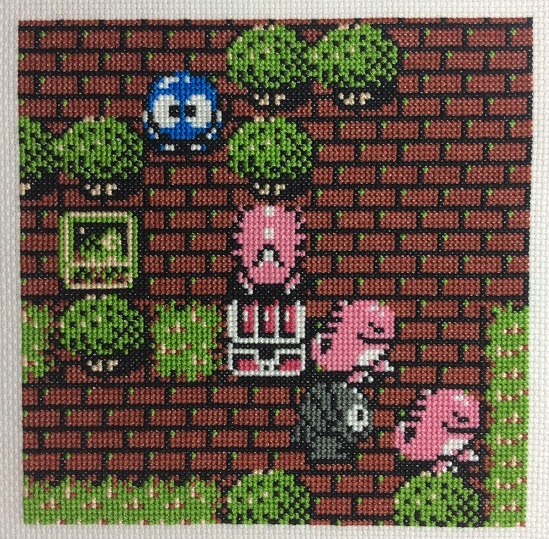 This second square for the Sprite Stitch SAL is from Pikmin 2 and was designed by katdun. It’s stitched on 14 count aida with two strands of floss. I haven’t decided yet whether or not I will fill in the background on the squares. 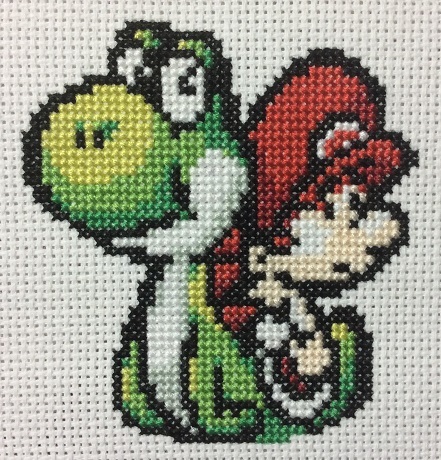 I think this one would look great with the background filled in, but I don’t want to do that much stitching until I’m sure this project will work in the frame I picked out. Once I’ve stitched a few more squares I should have a better idea whether I think this will work or if I’ll need to restart with a smaller count of fabric. It’s all about the trial and error!